It’s been six years since annual eCommerce sales first topped one trillion dollars. In the time since mobile shopping and the global spread of the web has helped that number to skyrocket even further. Experts now predict that number will cross four trillion dollars by 2020. These figures are certainly impressive, but how will such broader trends affect your business? The answer to that question will, of course, depend in large part on your industry, your business practices, and a number of other unique factors. But there are a few general predictions about the future of e-Commerce that will almost certainly ring true — and these facts may already hit close to home. New opportunities for growth will emerge as more people make purchases online. New competitors will arise, eager to compete for online customers. The companies that leverage technology and smart practices are sure to have the edge. While the last prediction about technology may seem somewhat obvious, the truth is that the high-tech world of eCommerce is sometimes surprisingly dependant on old, outdated systems. Many businesses still make mistakes like relying on human data entry or failing to diversify to multiple eCommerce channels. A tough reality is that the business of selling online has become more complex as the market has grown, and even the new e-commerce tools invented to help businesses come with their own set of challenges. Amazon has become an invaluable resource for getting your product seen, and your company known. Being able to sell online, across multiple channels, and with a company as prolific as Amazon can help your business climb to the top, but it is certainly not a guarantee of success. In order to combat the headaches associated with managing an e-commerce business, it is important to find tools that can make your job easier — and to find smart ways of managing those tools so that they actually contribute the way they were designed to. An excellent place to start to minimize and improve your workload is to look into financial software to help maintain, update, and understand things like reporting, payroll, inventory, and more. Investing in a QuickBooks Amazon Integration is a game-changing for businesses of all sizes, and can dramatically simplify and improve upon the process of compiling, analyzing, and maintaining important financial data, so that customer service, sales, and growth can remain in the forefront of your attention. QuickBooks is a software designed specifically with business and accounting necessities in mind. This software streamlines and provides solutions for accounting functions like reporting, online banking, payroll, automation, accounts payable, bi-directional synchronization, and much more. Millions of businesses have found QuickBooks to be one of the best options for improving and simplifying their accounting and financial needs, and for good reason. Quickbooks gives you an increased and more reliable control over your financial and accounting data and helps you get insight into profit margins and all updates regarding the financial side of your business. QuickBooks is an especially helpful tool for businesses that utilize online retailers/merchants such as Amazon, as it can drastically simplify the complex process of managing online orders, refunds, inventory, and so on. With automatic syncing, all these functions are made even easier, eliminating the countless hours often spent on manual data entry, reconciliation, and analyzing important marketplace details. 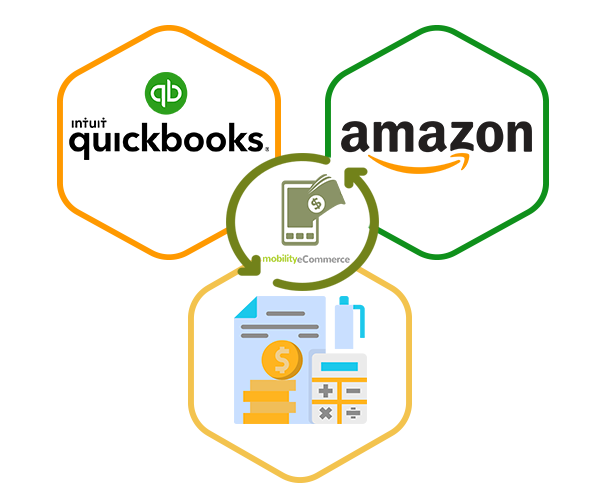 With the MobilityeCommerce Quickbooks Amazon Integration, MobilityeCommerce gives you the ability to manage all the financial data you collect through Amazon on the powerful yet intuitive QuickBooks dashboard. This integration will automatically record all sales, fees, tax information, and inventory updates. This means that all information across all sales channels is always updated and accurate, automatically. By empowering your team to seamlessly track information with the QuickBooks Multi-channel selling capabilities, you can rest assured that information is up to date for both you, and your customers. 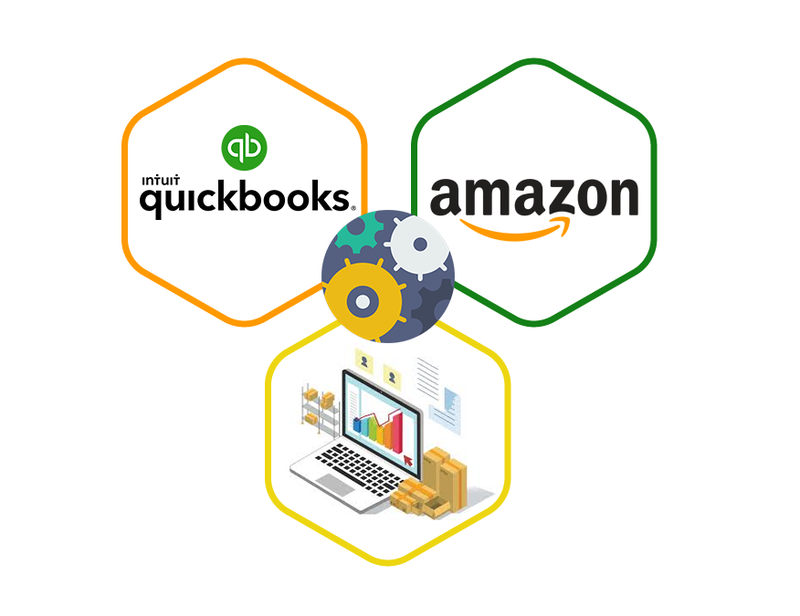 The QuickBooks Amazon Integration allows you to more easily handle every financial aspect of your business — from managing canceled orders and refunds which are automatically generated by QuickBooks, to monitoring profit margins more closely to know exactly where every last penny has been spent. Maintaining an accurate inventory count, purchase orders, expenses, etc. is vital to the reliability and reputation of your company. If you routinely have issues with a missing or unavailable product, or you neglect to record a piece of financial information for a client, your reputation can be put in jeopardy. QuickBooks is able to seamlessly sync inventory data between channels, ensuring inventory count is correct, giving you the ability to better plan for future reorderings and inventory maintenance. MobilityeCommerce also plays a role in helping to maintain inventory accuracy by adjusting receipt, invoice, actual inventory counts and more, and syncs all this information with QuickBooks to ensure price and quantity data is always up to date. The MobilityeCommerce QuickBooks Amazon Integration allows for fast and easy inventory entry via barcode scanner, which also helps in the easy tracking of items as they travel between multiple locations. Barcode scanning abilities also help to eliminate accidental double data entry and can aid in the QuickBooks featured automatic packing list and invoice data entry. The QuickBooks Amazon integration also allows for inventory tracking to be done down to the most minute detail, like bin level or serial number. 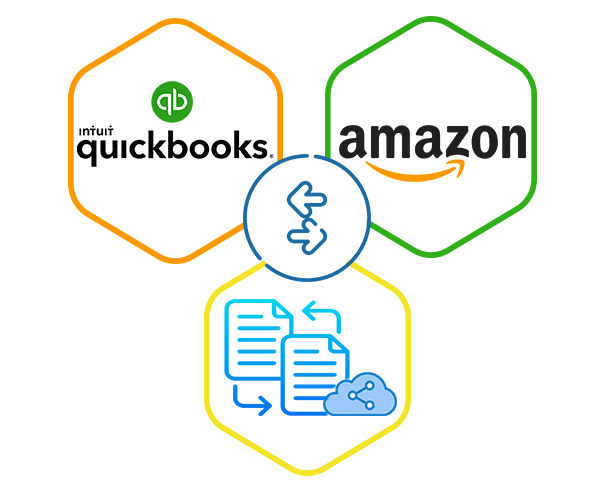 The QuickBooks Amazon Integration combines all expenses onto a single invoice; this is done automatically by the software, which saves you time by virtually eliminating the need for manual entries, and minimizing the need for fixes due to human error. All financial information can be synced and compiled across channels, meaning you can easily sync data between your point of sale system and your accounting program. This also enables you to better understand just how your money is being spent by combining data from all marketplace commissions, fees, charges, shipping tax data, etc. With automatic syncing and compiling of vendor information, you are easily able to track which items were received, and from whom, and save yourself countless hours of manual entry and reconciliation. As mentioned above, the QuickBooks syncing functions are incredibly useful for the simplifying and improving your accounting system. This software allows you to easily sync price and product information from your existing POS to QuickBooks to MobilityeCommerce, which then allows you to add a connection to Amazon, or other selling channels. This feature ensures that you are never stuck with incorrect or old information and that you will be able to find correct information at a moments notice, all on a single platform. Syncing capabilities aren’t limited to inventory; along with products, you are also able to sync customer information and order forms with QuickBooks to help in the management of order fulfillment. This also includes that fast and easy import of all orders and refunds through Amazon in order to ensure your QuickBooks accounting solution is as comprehensive as it is easy to use. Interested in the MobilityeCommerce Amazon QuickBooks Integration? Learn more about how MobilityeCommerce and our incredible sales and marketing integrations can help you and your business by visiting our us online today. We offer a platform for wholesalers, distributors, drop shippers, product companies and more to sell on a variety of marketplaces/ like Amazon, eBay, Walmart, and more. MobilityeCommerce offers you access to some of the best and most popular e-commerce channels and selling platforms worldwide as well as integrations and a platform with which to better manage and organize your e-commerce business.